1) This is pure awesome: Namibia has designated its entire coastline as a national park. “The Namib-Skeleton Coast National Park covers 26.6 million acres, making it larger than Portugal” and “stretches for 976 miles (1,570km), from the Kunene River, at the northern border with Angola, to the Orange River, on the border with South Africa, and is expected to be promoted as a unified destination. The protected coastline consolidates three national parks: Skeleton Coast, Namib-Naukluft and Sperrgebiet. The last is the site of Namibia’s diamond mines, which have long been closed to the public.” The U.S. should do the same with its coastline. Evict all squatters! 4) On Tuesday, February 15, the Arid Lands Institute will present the next speakers of their lecture series, Excavating Innovation: The History and Future of Drylands Design. They are Vinjayak Bharne and Pruned hero Dilip da Cunha. 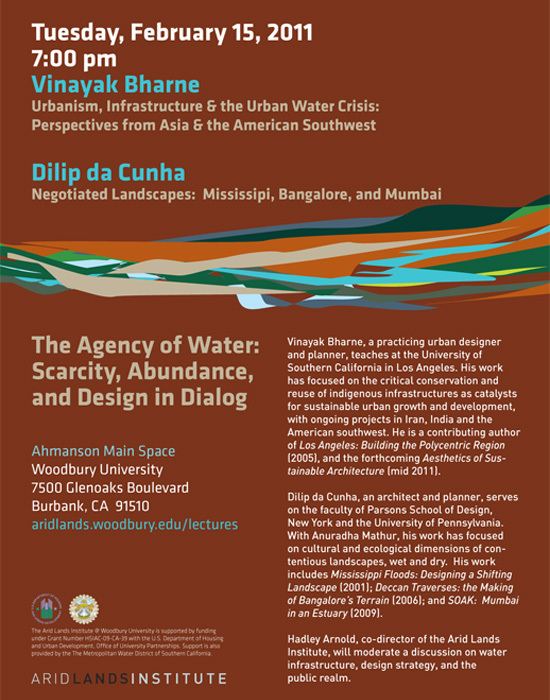 See the poster below for the title of their talks. If you can't make it, videos of the event will be posted on the institute's website. 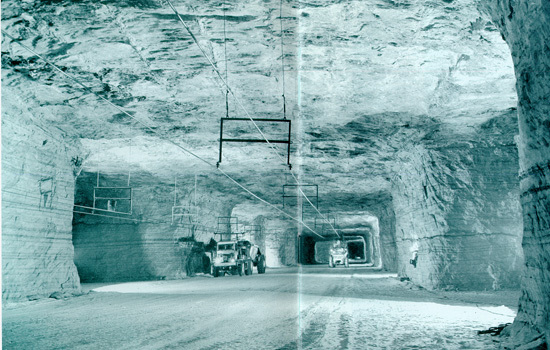 9) With gold prices soaring, old mines in California are reopening. 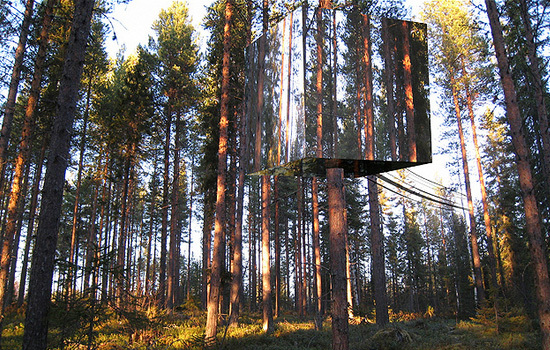 10) From March 4 to April 1, 2011, “media-artists, speculative designers, avant-garde businesses and bleeding edge researchers working between life and technology” will gather together in Amsterdam for the second TransNatural event. In Chicago, don't call 811! 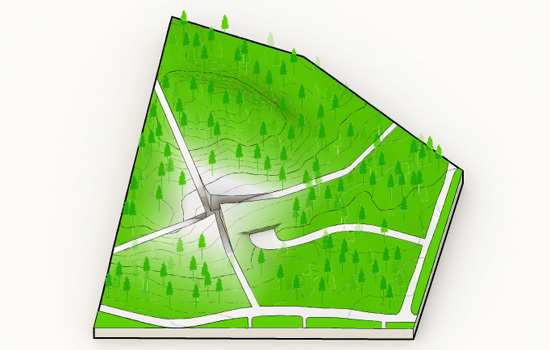 / Our Solar Garden has rhizomatic subways bulbous with solar aviaries designed by Lequeu and Boullée. / In Mapping Abysses & The Catacombs of Rome in 3D, we call for a distributed network of autonomous laserscanning spelunking rovers to map out necropolises, ancient underground aqueducts, sewers, stormwater megatunnels, abandoned subway tunnels and transdimensional portals. A surprisingly high trafficked post: Dos personas en el centro de Sevilla / Cave Pharming / Call 811 to demand a National Subterranean Archive! 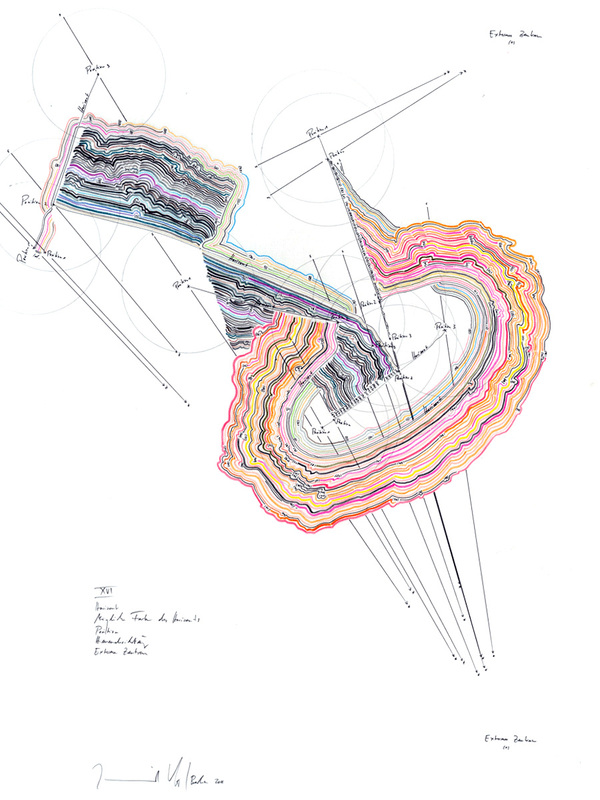 / The Descent / From the Giant Guatemalan Sinkhole to The League of Super Amazing Landscape Architect Friends. 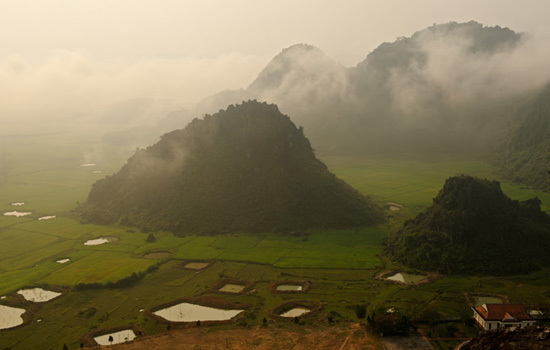 These scars are still very much a part of the Vietnamese landscape. In Quang Binh and Vinh Linh provinces (just nort and south of the former demilatrized zone) the landscape resembles the face of the moon, with craters 30 to 50 feet in diameter and several yards deep. 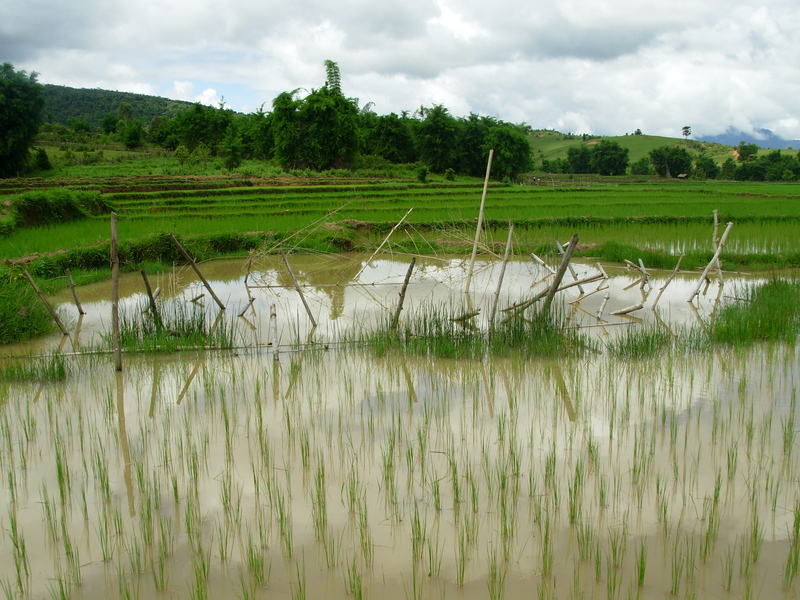 Villagers have transformed the bomb craters into ponds for growing fish, a staple of the Vietnamese diet. In the south, bomb craters are favored sites for houses, with a replinashable source of protein at the doorstep. One house here, another house there, and still more over there. Soon a city accretes around these calderas, its neighborhoods encircling, like atolls, a necklace of aqueous farmlands, while nearby streets ripple out like wavelets dissipating from the point of impact. All unexploded ordnances may have long been found and disposed, the soil fully remediated of tactical herbicides and defoliants, all traces of war erased, except of course these bomb craters permanently embedded into the urban grid. It seems like everywhere you turn this week you hit something BIG, either their ski mountain incinerator plant or their pyramid condo. 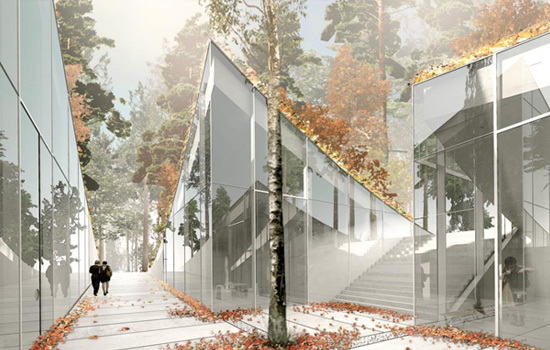 We though we'd join in all the drive-by copy-pasting fun with a favorite project: their design proposal for a crematorium in the famed Woodland Cemetery in Stockholm, Sweden. 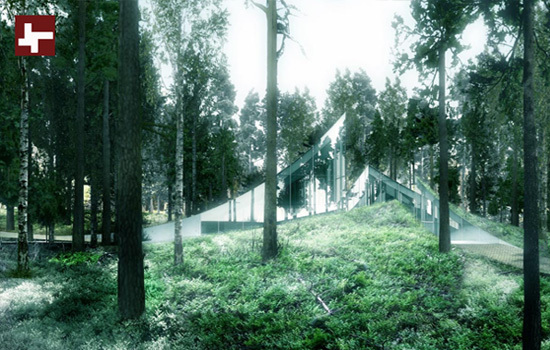 As a counter proposal, instead of this high energy funeral rite, how about a forest version of a Zoroastrian Tower of Silence or a Tibetan sky burial? Low energy but still utra rapid atomization. A Treehouse of Silence? 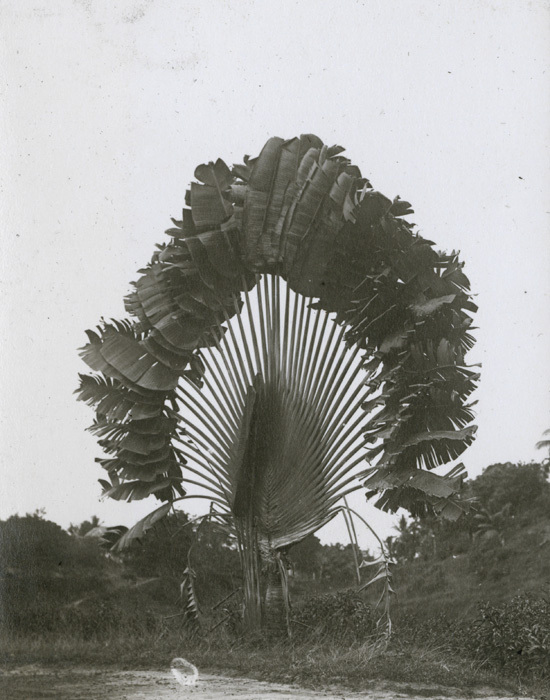 A canopy burial? 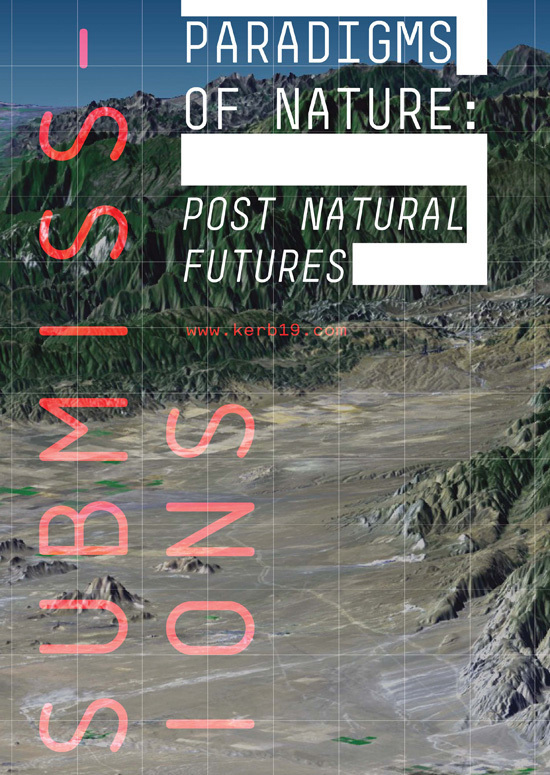 Kerb 19 is seeking submissions which explore the theme Paradigms of Nature: Post Natural Futures. Are we steering in an 'un-natural' direction, or taking the evolutionary leap necessary to establish a more integrated mode of co-existence? We are entering a period of extreme technological escalation, where we can now synthesise technologies with living systems. 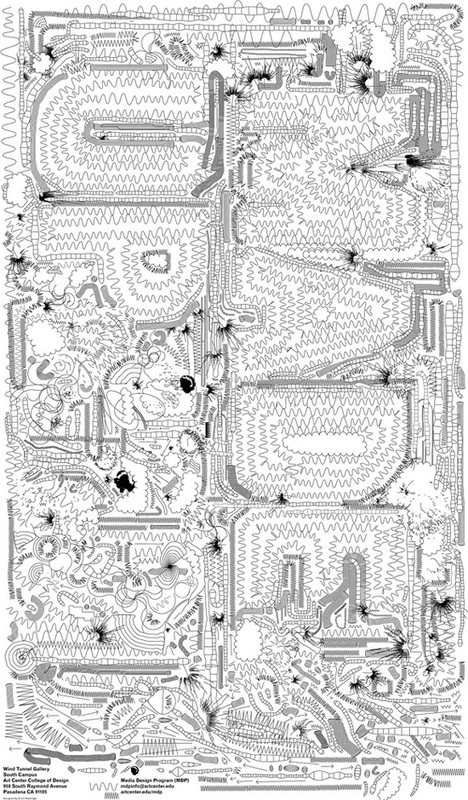 It may soon be possible to create self-generating, manufactured landscapes that have the ability to grow, repair, decay and multiply, responding to a multitude of forces. How will the development of these bio-technological possibilities shape the way we create landscapes where the city environment could transform into a dynamic, interactive organism of limitless potential? In what ways will the urban landscape adapt and change with these neo-natural realities, where it becomes increasingly difficult to draw tangible lines between what we preserve as ‘natural’ and ‘artificial’? 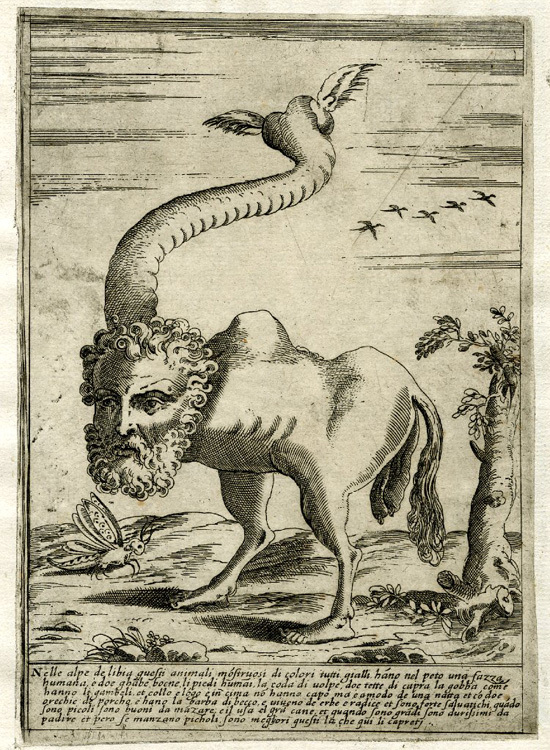 But will all this current wild speculation about a future predicting synthetic biological ecologies, trans-natural robotic systems and post-natural organisms ever be realised, and how useful is it in meeting our collective ideals? 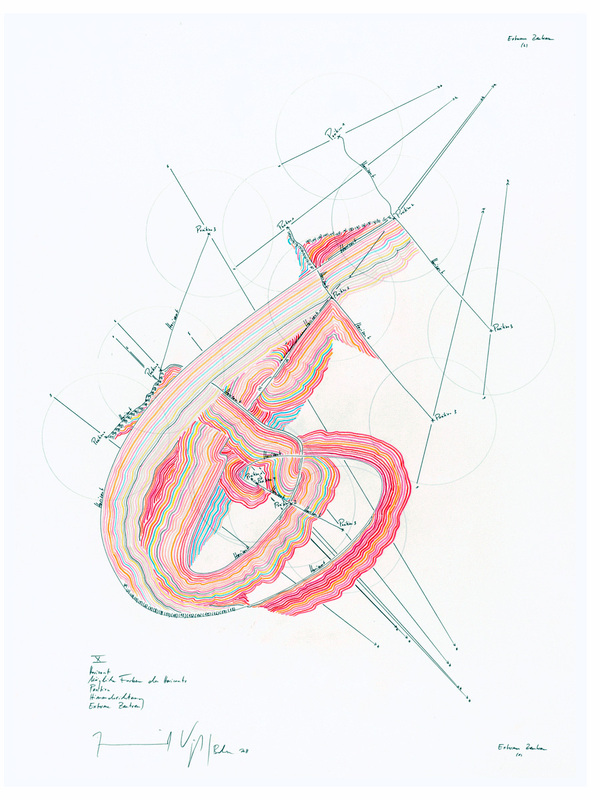 Send submissions by 14 March 2011. More here and more again next month. Which is one of the many ideas you can submit to the Chicago Architectural Club's annual Burnham Prize Competition. 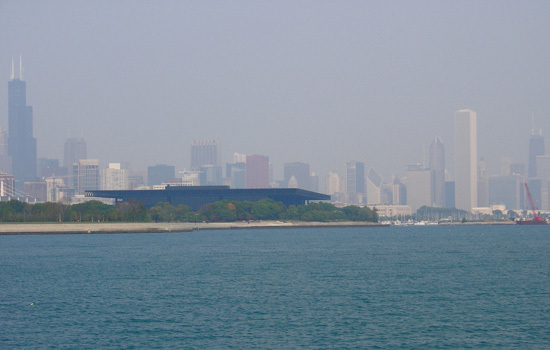 Built on parkland meant to be “forever open, clear, and free”, considered an eyesore by open space advocates, and suffering from benign neglect at the hands of its owners, the Metropolitan Pier and Exposition Authority, Gene Summer’s design for McCormick Place East is nevertheless a powerfully elegant exploration of some of modernism’s deepest concerns. The current building’s predecessor generated withering criticism from civic groups so when it burned in 1967 its critics mobilized. The raw economic power of the convention business served to hasten rebuilding atop the ruins. 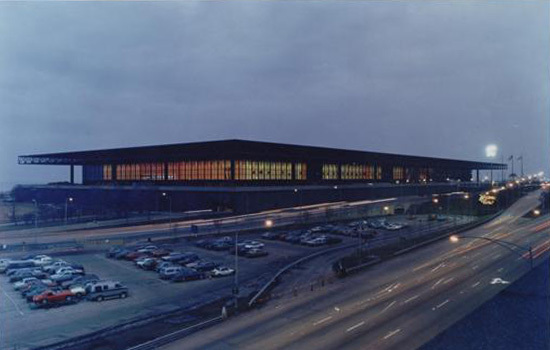 But while Shaw’s previous building lacked any architectural merit, Gene Summers brought to the new project his years of experience at Mies van der Rohe’s side. The resulting building is a tour de force that succinctly caps the modernist dream of vast heroic column-free interior spaces. Will you, as Chicago Tribune's architecture critic Blair Kamin suggested, propose to tear the entire building down and restitch the lakefront's splintered parkland? Despite one of its member's aversion to ideas competitions, it would be awesome to see an entry from the FAT gang. You have until 4 April 2011 to send in your proposals. During the Vietnam War, the United States flew more than 580,000 bombing missions over Laos. That's equal to one bombing mission every 8 minutes around the clock for 9 full years. 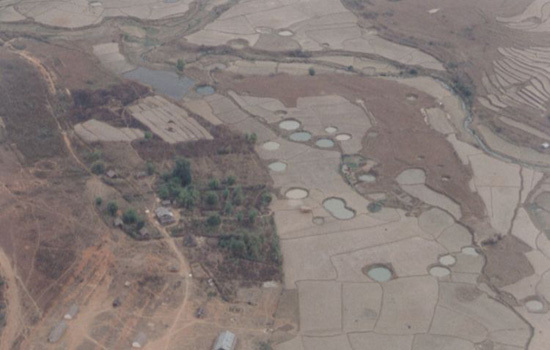 In fact, the country's Xiengkhouang Province, where the famous Plain of Jars is located, is considered the most heavily bombed place on earth. 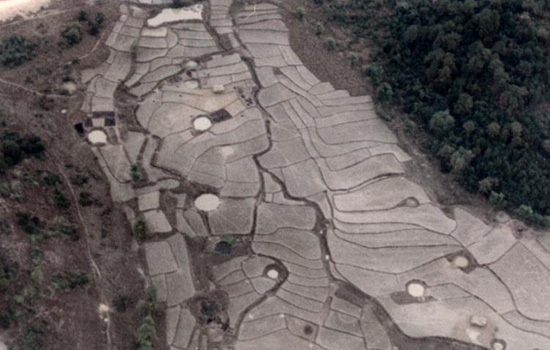 This intensive bombing campaign left the landscape pockmarked with craters. 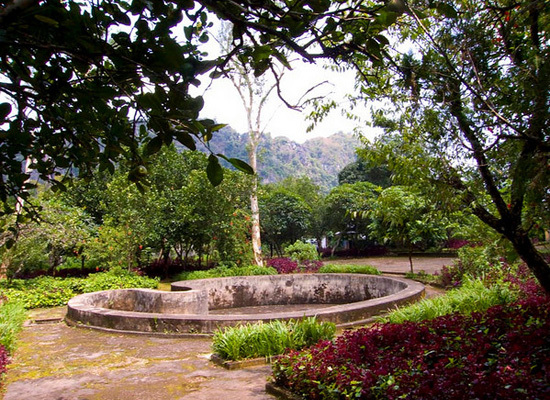 One of these craters formed mere feet away from the house of Prince Souphanouvong, later President of Laos. A trained civil engineer, he turned the hole into a kidney-shaped swimming pool, flourished with a fine biomorphic indentation. A symbol of decadence cultivated out of hellfire and Cold War geopolitics. Perhaps one day a cluster of these craters will be turned into an inverse archipelago fed by hot springs, connected together by channels, next to a luxury eco hotel, both designed perhaps by a Laotian Paisajes Emergentes, that is, a cadre of bright, enthusiastic, young tykes helping to lift their country from decades of economic strife and social conflict through design. 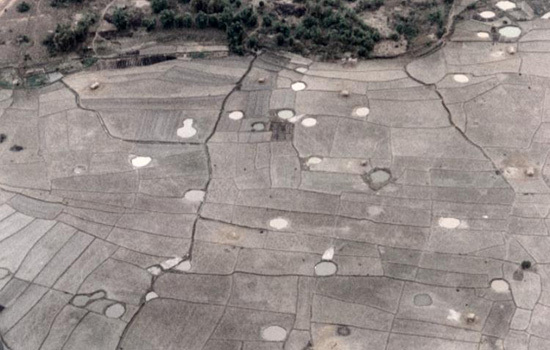 In any case, the Klimt-like pattern of these circular craters embedded into a tapestry of rice fields may be mesmerizing to look at, nevertheless, these aerial photos belie the fact that millions of unexploded bombs remain on the ground, all posing a deadly threat to civilians. There are still millions of silent craters waiting for that human touch. Because there's been quite a lot of talk about the possibility of traffic disruption on the Suez Canal caused by the civil unrest in Egypt, we read up on the history of the waterway, primarily using Wikipedia, of course. 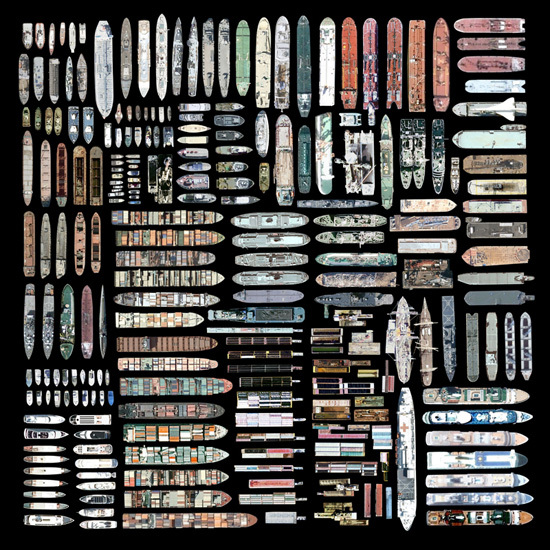 In the process, we again stumbled upon the so-called Yellow Fleet, a group of 14 international vessels trapped in the canal during the Six-Day War of 1967. After the short-lived war ended, the ships were still unable to pass through, as the canal remained closed. 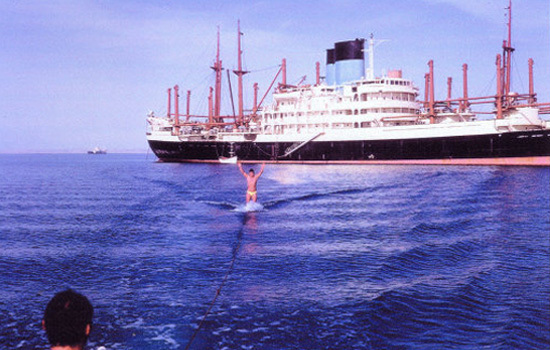 All ships were forced to anchor together in the Great Bitter Lake, and there they remained until the waterway was re-opened in 1975 — 8 years later! Of course, the crews weren't trapped there during all those years, left there to fend for themselves on the border between belligerent countries. Some were allowed to go home, and relief crews were brought in. But the ships always had a crew to maintain them. 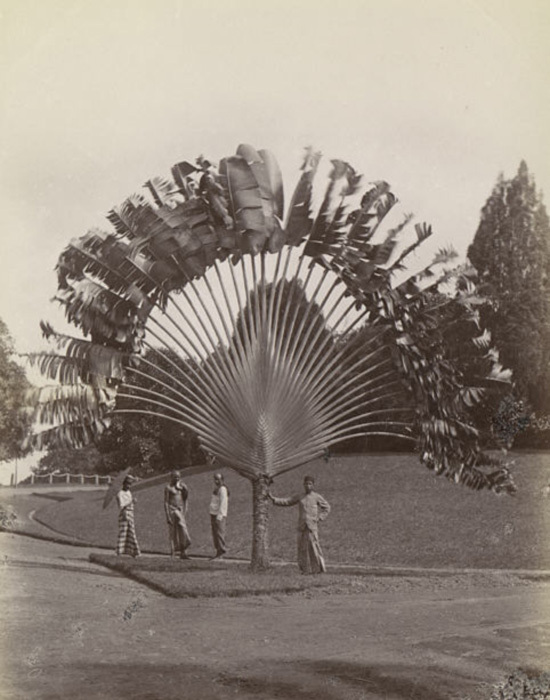 We're a little disappointed not to hear of some gardening that might have gone on — of defiant gardens cultivated not for food necessarily but as a place of respite in the middle of the war and the desert. 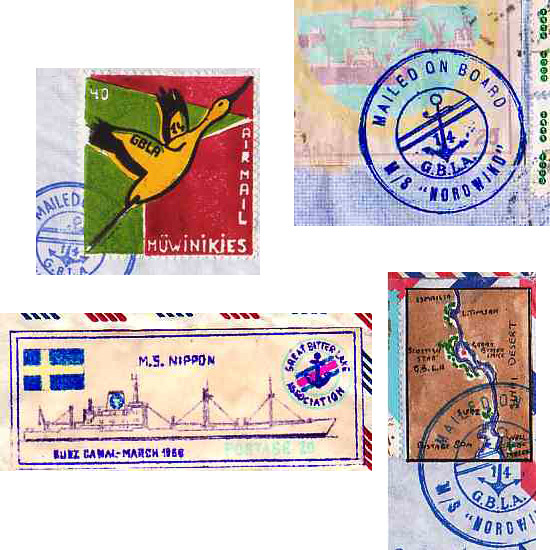 Surely in a parallel world Suez Canal, the Egyptian postal service simply allowed all mails from the fleet to go through with only the homemade stamps. “Surely a few envelops aren't going to bankrupt the system,” they reasoned. The fleet having been vested with one of the attributes of sovereignty, the captain of the Swedish ship MS Nippon, a Kurtz-like figure turned mad by the omnipresent sand — by that grit in his mouth that he wakes up to every morning, those granular bullets that constantly blitzed his eyes, that coarseness in his crotch, the protective keffiyeh he wears but overheats his polar blood, was then inspired to declare his vessel sovereign territory. Other captains followed his lead, their mental healths, too, having deteriorated not long ago. An archipelago of micronations was thus born. The spring of 1975 came and went, but the canal remained closed. Another 8 years would pass before traffic was able to go through again, long after the owners of the ships had abandoned their costly efforts to repossess them. 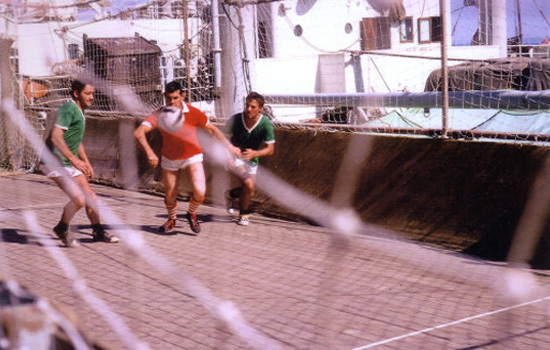 During that time, the President-Captains further consolidated their rule. Both Egypt and Israel were too busy with other matters to pay attention, but in the Camp David Accords, the two countries finally recognized their sovereignty. Flash forwarded to the present through the ensuing decades of relatively prosperity fueled by boutique stamp production and Lonely Planet-toting trekkers, and there's another crisis. (For in this parallel world, conflict is also a constant.) Another Suez Canal blockade, another fleet trapped, another Bitter Lake Olympics. And more captains going unhinged from a decade of isolation, then more micronations. In another Camp David powwow, the major powers insist that Egypt cede control of the canal to the League of Suez Canal Micronations to ensure that no future conflict will again disrupt the flow of trade.